I tend not to buy anything from auction; I’m generally a Buy It Now only shopper. Buy It Now works essentially like any other online shopping – the price is set, and you can agree to it. Auctions stress me out, especially since the “maximum bid” feature was introduced. Given that I pretty exclusively buy from Buy It Now selections, the seller rating matters a lot. [I’m sure it matters a lot with auction items, too.] I don’t buy from any seller with a rating below 99%. This is not as steep a standard as you might think. Some Buy It Now products have a “make offer” button below the price. ALWAYS USE THIS. Never ignore it. It essentially says that the seller is willing to agree to a lower price than s/he set for Buy It Now. Even if you think the Buy It Now price is fair, you might as well try to negotiate a lower price. This is eBay, not philanthropy. If you’re asking “Why is this on eBay for $20 when it costs $30 from the merchant?” it is a GOOD QUESTION, and one you should constantly be asking yourself. [N.B. this applies more specifically to new products at Buy It Now prices. 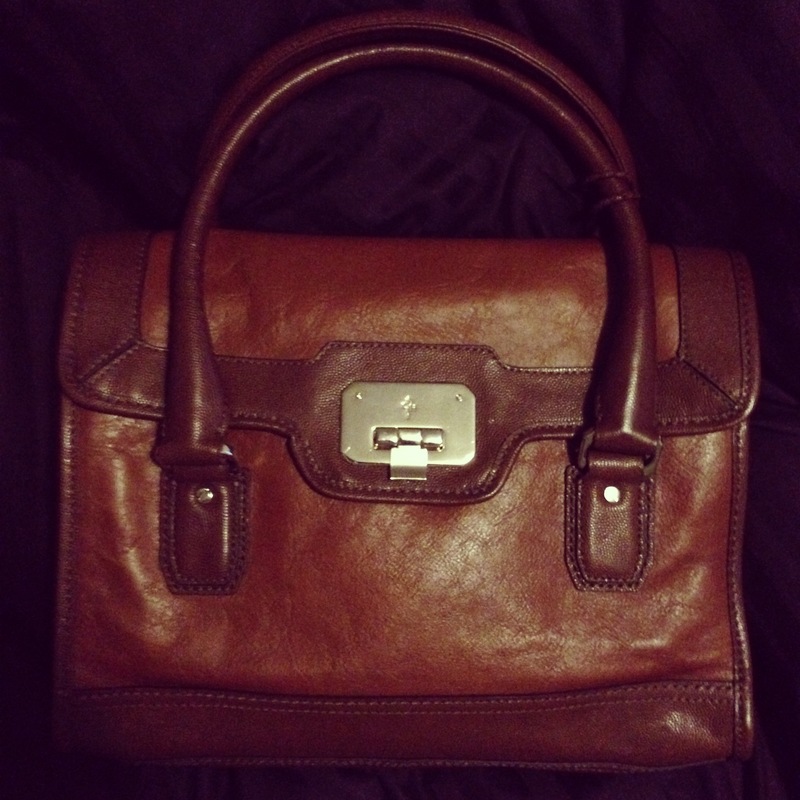 Used products, such as the above purse, and auctions have different rules.] You do NOT want to get caught up in someone selling stolen property. Generally the most reliable products are the ones that are only a few dollars (or percentage points) below the price you’d find in-store, because those sellers probably got the products in bulk or on a promotional discount. If it’s way below what you’d expect to pay for it, it’s likely either stolen or fake. Used items: they’re tricky. I get a bit squicked out by the thought of used clothes or shoes (so you’ll probably never see a post on thrifting from me) but I have bought plenty of gently used purses and jewelry items from eBay. Make sure you see photos from every angle (front, back, side, bottom, inside, zoomed in, etc) and double-check the seller’s ratings. Never be afraid to ask for more photos. Always trust your gut with a seller. An exception to the beauty product rule: if there’s a Gift With Purchase going on at Macy’s, but I don’t want any of the Purchase products required to get the Gift, I’ll check eBay for the GWP. Usually somebody is selling it. Make sure you get it new and unused. I got a fabulous gym bag sized face palette from Bobbi Brown this way. I’d otherwise have had to spend $150 at Saks to get it. Some of my biggest eBay success stories: Off-season colors of classic J. Crew work dresses. The aforementioned Bobbi Brown palette. TIGHTS. So many tights. (All NWT. Obviously. Ew.) Theory blazers. And, of course, gently used purses. Thanks for the tips! I’ve never shopped from Ebay – it scares me. But maybe I’ll give it a try now!